Richmond Battlefields Association (RBA), established in 2001, is a nonprofit 501(c)3 organization dedicated to the preservation of historic Civil War sites surrounding Richmond, Virginia -- the former capital of the Confederacy. We work with landowners to protect hallowed ground through donations of property, land purchases and preservation easements. RBA is an all-volunteer organization dependent on the support of its members. In the past decade, their dedication has helped preserve more than one hundred acres of battlefield land, valued at greater than $1 million. There is still much to be done and the clock is ticking. We are losing hallowed ground everyday! Please join us at this critical time to help save America's endangered Civil War battlefields. Join Richmond Battlefields Association now and protect a crucial part of our nation's heritage for future generations to appreciate and enjoy. 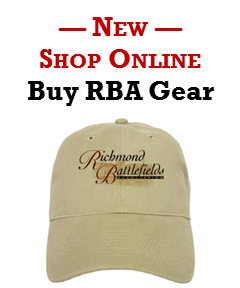 The Richmond Battlefields Association is a 501(c)(3) non-profit organization. Your contributions may be deductible as provided in 26 USC Sec 170. Masthead: Battle of Gaines Mill Valley of the Chickahominy (NARA 530495). 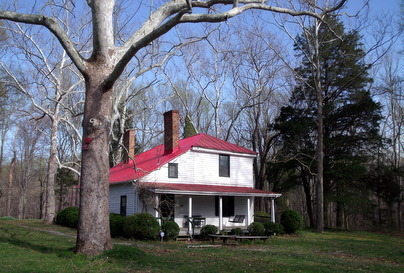 Left: The miller's house at Fussell's Mill (2nd Deep Bottom). 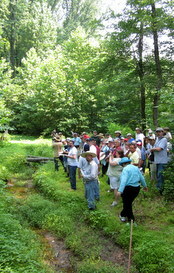 Above: RBA Annual Meeting & Tour, Gaines' Mill (June 2011).